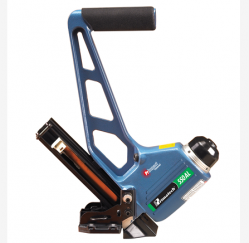 Primatech 550AL – 550ALR Adjustable Base Nailer | Hy-Cor International Inc.
Have You Gone Hy-Cor Today? The 550A’s articulated, dual action and fully adjustable base enables it to deal with an infinite variety of solid / engineered flooring from 3/8″ to 3/4″ (10 to 19mm). 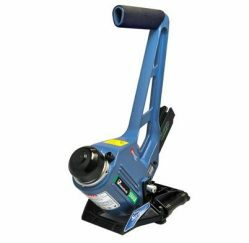 The 550A's articulated, dual action and fully adjustable base enables it to deal with an infinite variety of solid / engineered flooring from 3/8" to 3/4" (10 to 19mm). Short nose and compact valve design provide an all around striking surface, enabling the nailing of more boards closer to the end walls. No shims required. The built-in adjuster eliminates the use of shims to match the board thickness. Telegraphy (Dimple Effect) control. The adjustable front block allows for ultra-fine positioning, as it corrects the nail penetration to minimize or eliminate surface deformation. PrimSurfer add-on kit A861 available for this model. All the features of the 550AL with the added benefit of factory-installed PrimSurfer rollers. All the features of the Primatech 250A with the added benefit of factory-installed PrimSurfer rollers. The Primatech 250FL FIXED base plate pneumatic fastening tools embody the most advanced technical developments in flooring installation. The Primatech 250A features a fully adjustable baseplate. Primatech 245 PRO pneumatic flooring tool is designed for the flooring professionals. It is equipped with a powerful click valve mechanism, for a closer reach to end walls. Click to view or download. "Games are won by players who focus on the playing field -- not by those whose eyes are glued to the scoreboard"
Did you know that Hy-Cor offers on-site (ours or yours!) training for many of our product lines? From temporary power and lighting, to fall protection to personal safety equipment, let us help you know the products we sell better! Contact your Hy-Cor representative for more information or to make an appointment. Are you protecting your equipment?